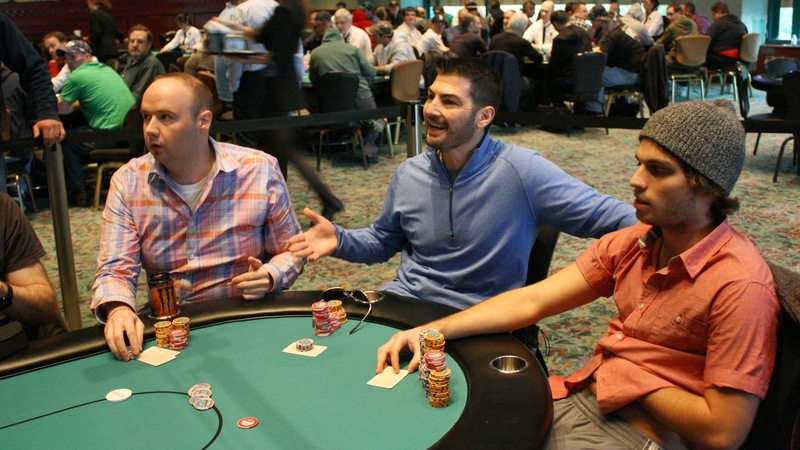 When they started heads up, Stephen Dare and Greg Hyman were nearly equal in chips. But over the course of a few levels, Stephen had won quite a few pots and had Greg on the ropes. They finally got it in as a coin flip, with Stephen holding [6s][6d] to Greg's [Ac][Kc]. The flop was fairly good for Stephen when it came [3s][4s][5c], and the [7s] turn left Greg drawing to a chop. 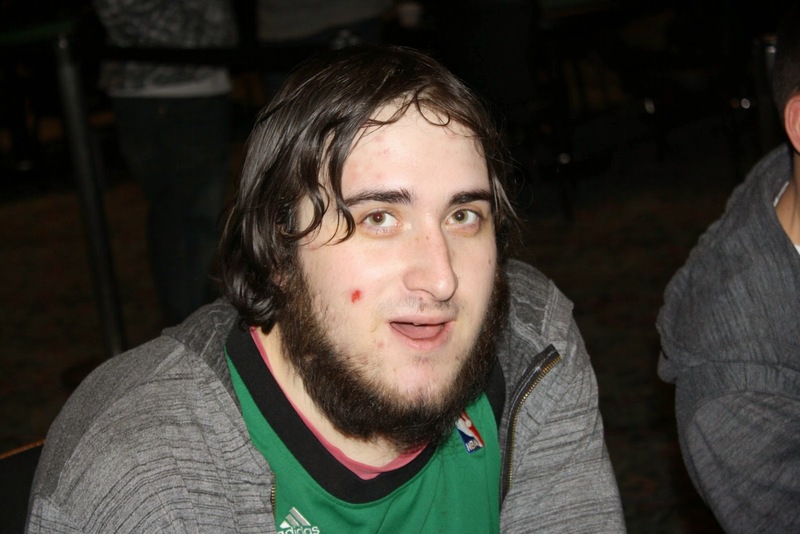 The [5h] river was just one pip from salvation, and Stephen Dare wins the tournament. For his performance today, Stephen will collect $21,489 along with the title, the trophy, and the watch. After losing a big pot to Stephen Dare, Jonathan Drane moved his last 11 big blinds in from the button. Stephen tank folded the small blind, later saying he had a king, but Greg Hyman called fairly quickly from the big blind. Jonathan couldn't find much on the [3c][4h][4c] flop, but the [7c] turn gave him a flush draw to go with his overcards. The [5h] river did not improve his hand, however, and he will exit this tournament in 3rd place. Jonathan earns $10,705 for his efforts. 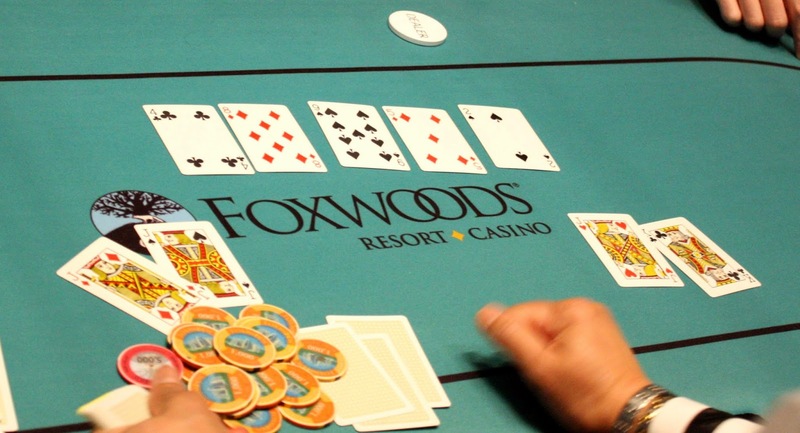 Tomorrow is Friday, and that means the Foxwoods Poker Classic $2,700 Championship is upon us. 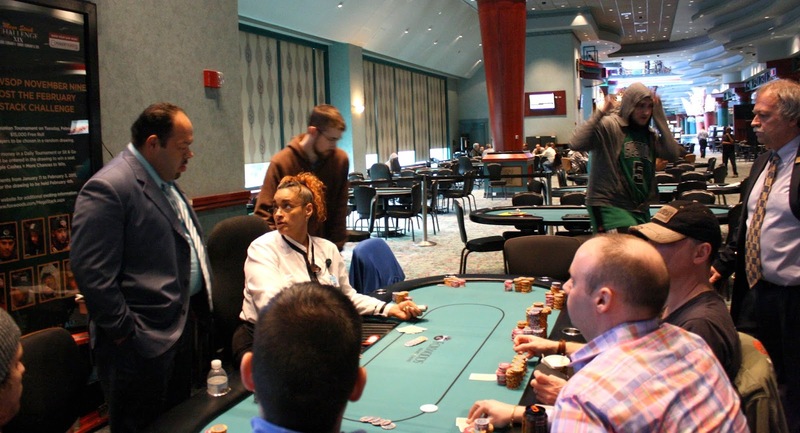 The tournament starts at 11am and features hour-long levels and a 30,000 starting stack. The tournament will wrap up on Sunday night. 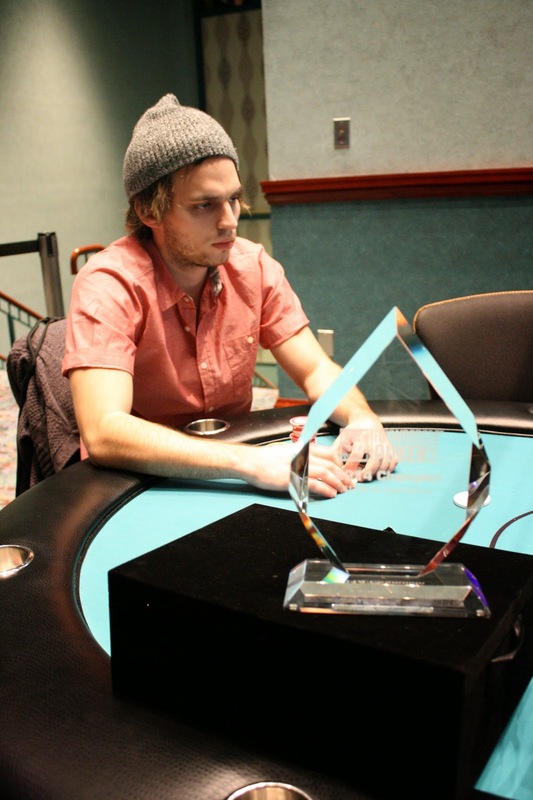 Last year's winner Justin Schwartz beat out 191 other players to collect $112,582. At 9am, there will be a last chance $300 mega satellite. 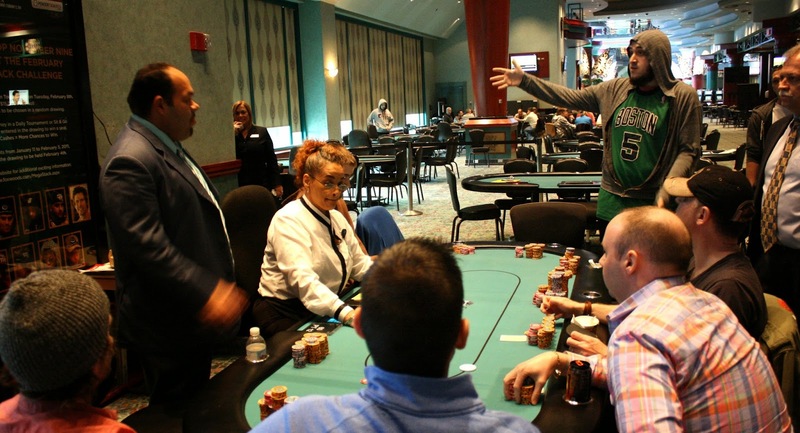 The tournament is a turbo structure with 10 minute blinds, so you'll get into the Championship with plenty of time to play on Day 1. Full structure is available here. Make sure you tune in to www.FoxwoodsLive.com to watch our featured table at 11am. 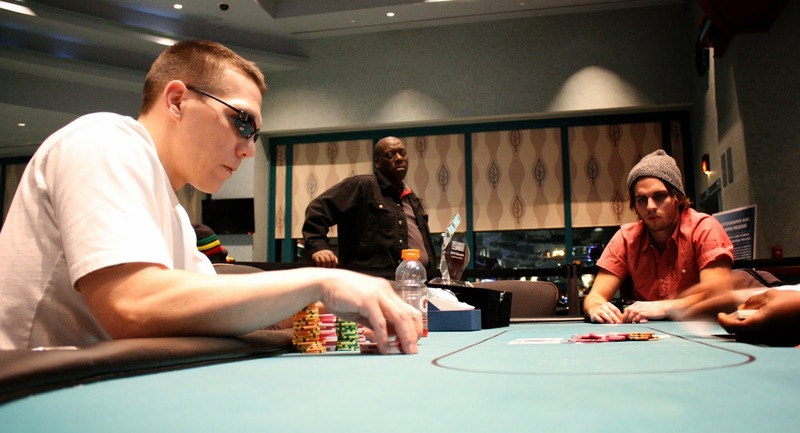 Both players had flopped flush draws, but Greg's jack high was strongly in front. 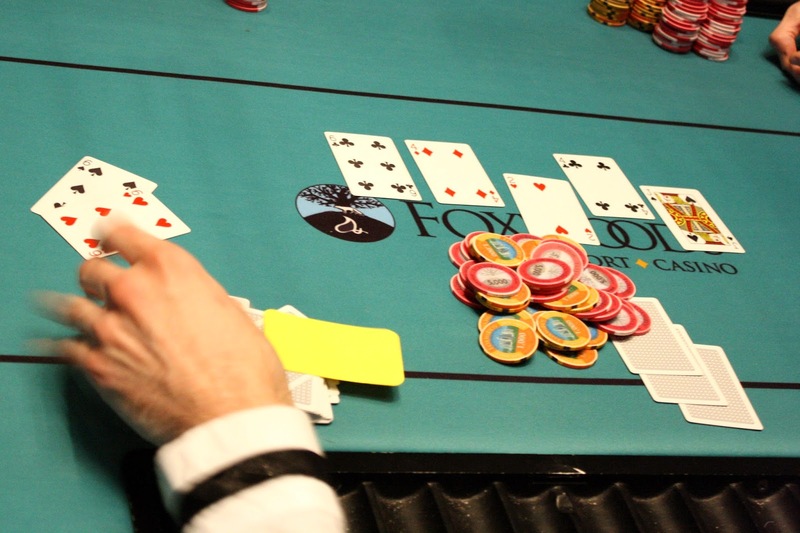 The [Qd] on the turn made both players flushes, but again, Greg's jack high flush was superior. The insignificant [3c] fell on the river, and the stacks were counted down to confirm that Gennadiy was cover. 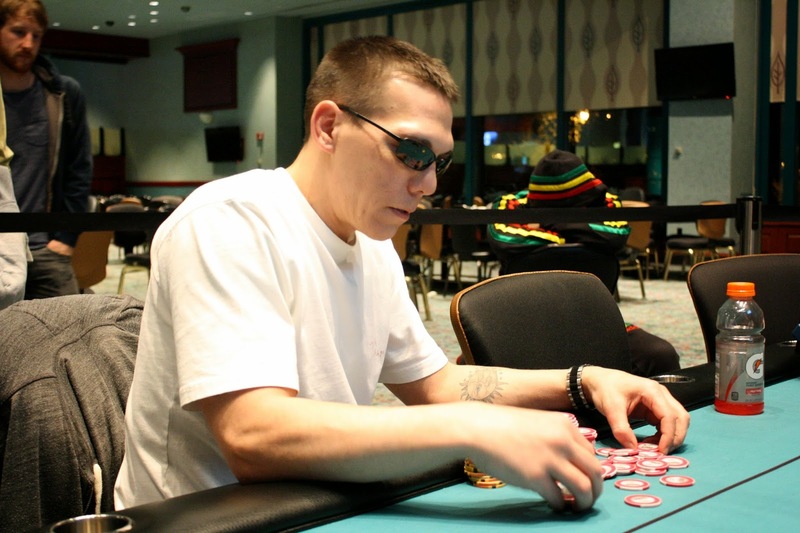 By less than one big blind, he was, and he will exit this tournament in 4th place, collecting $8,029 for his efforts. 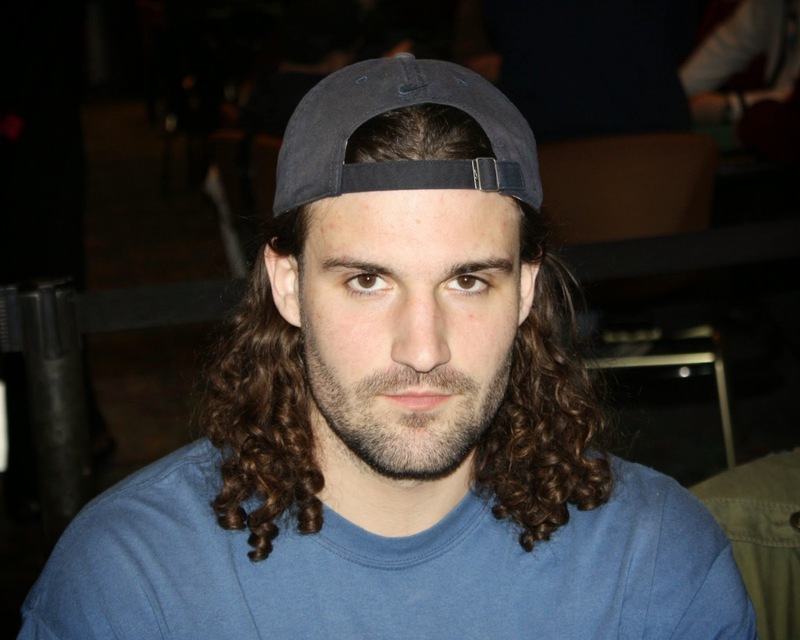 Dominick Pelli was all in preflop with [Kc][Js] against Jonathan Drane's [Ac][5d]. Dominick failed to improve as the board ran out [4h][Ad][Jc][Ts][4c], and Dominick will collect $6,043 for his fifth place finish. Joshua Samier has been eliminated when his [Ac][5c] was outdrawn by his opponent's [Kh][Qs]. The board ran out [7c][4h][Ks][6s][Jd] to send Joshua to the rail in 6th place, collecting $4,834 for his efforts. Chris Walsh has been eliminated when his [Th][2h] failed to improve against Greg Hyman's [6d][6s]. 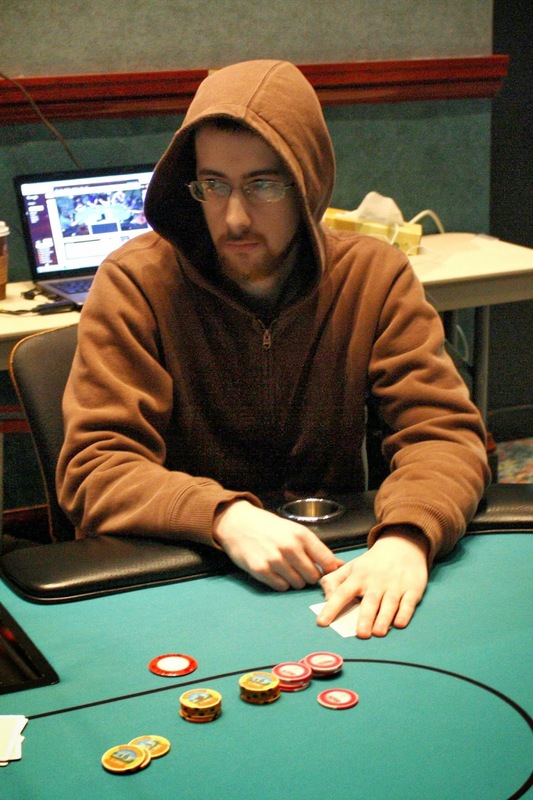 The board ran out [Tc][2d][5h][9h][7c], and Chris will collect $3,973 for his 7th place finish. 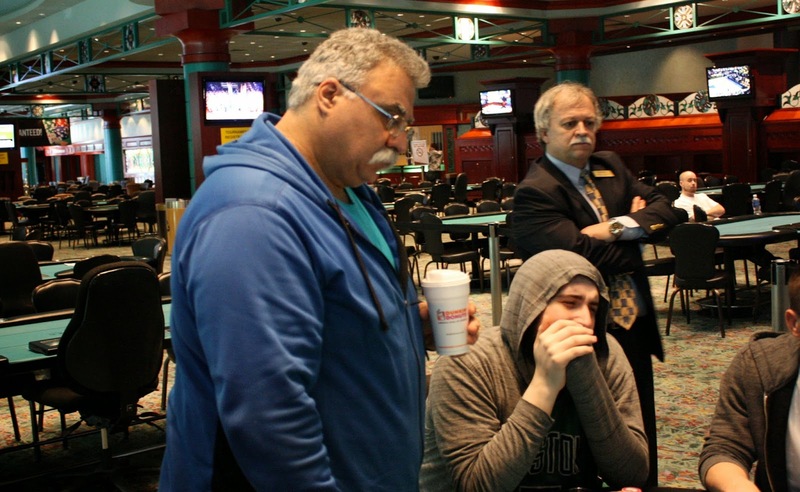 After checking through on a [Kh][Kc][3d] flop, Chris Walsh check raised Gennadiy Kostrov's bet on a [4s] turn. Gennadiy called, and the two saw a [Jd] river. Chris bet again, but this time Gennadiy raised, putting Chris to a decision for most of his chips. After quite a long time in the tank, Chris made the call and saw the bad news, as Gennadiy had flopped a full house with his [Ks][3h]. After paying off the bet, Chris was left with only 25,000 at 5,000/10,000 blinds. He folded the next hand, but on the last hand before dinner break, Chris got the rest of his chips in against Joshua Sarmir in the small blind. Chris was in the lead with [Ac][7s] against Joshua's [Qd][6h] and improbably, Chris flopped a full house when it came [Ah][7c][7d]. The turn came the [2c] and the river came [7h] to give him unnecessary quads. Chris goes into dinner break with 65,000. Dominick Pelli was all in preflop and called in three spots. The three players checked to a river on a board of [6c][4d][2h][4c][Js], and Dominick jumped out of his chair and yelled, "I have a boat!" 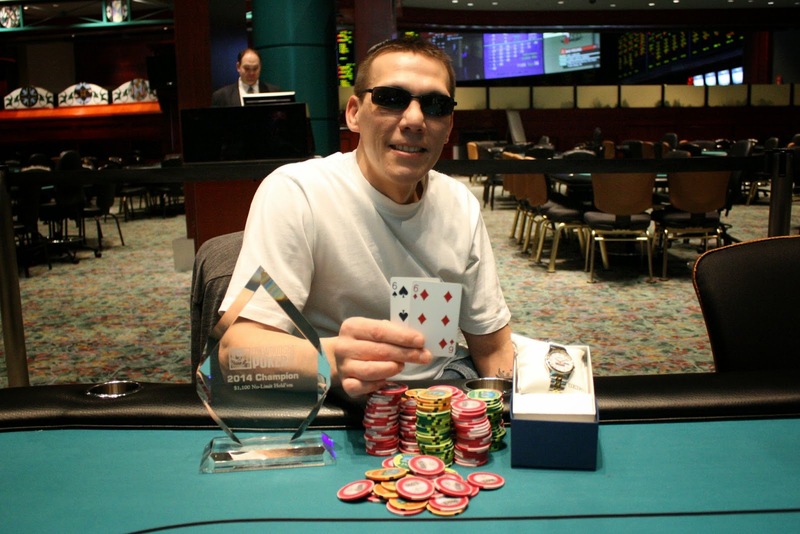 He did indeed as he tabled [6s][6h] to scoop the pot and claim a quadruple up. 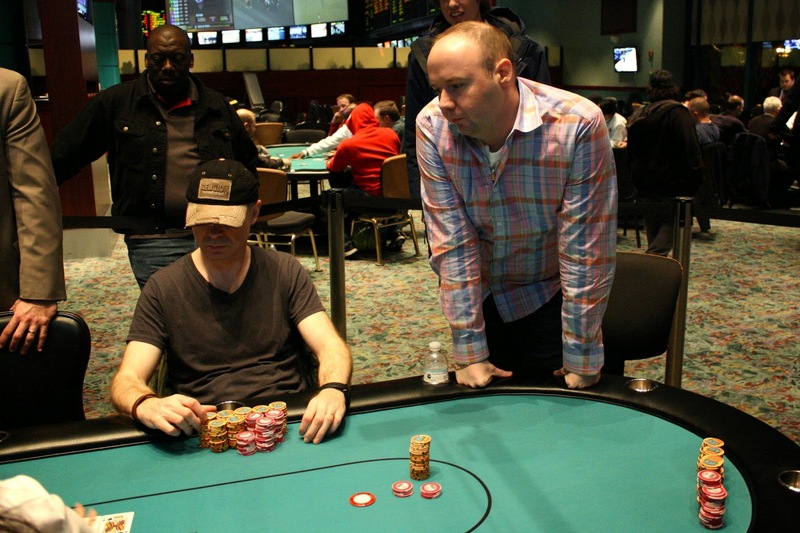 Stephen Dare opened the pot with a raise before Chris Walsh three-bet, next to act. 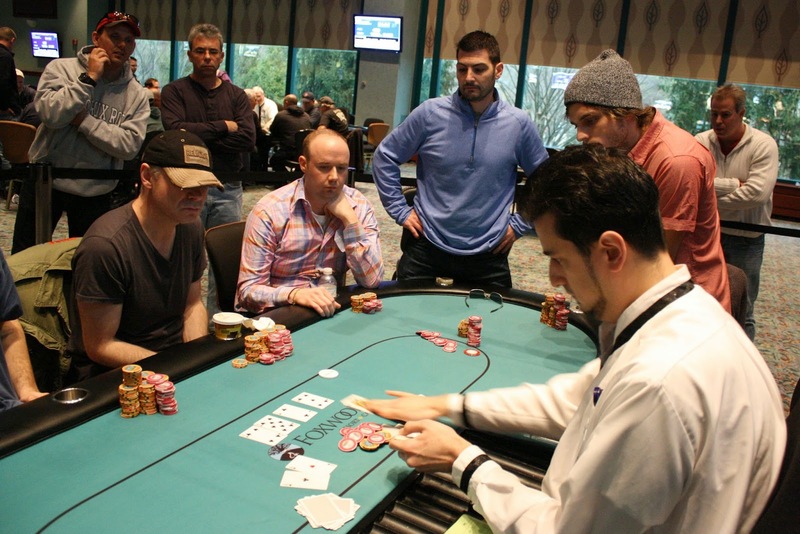 Action folded to Steve Happis who moved all in. Stephen instantly moved all in over the top, and Chris took a few beats before folding. 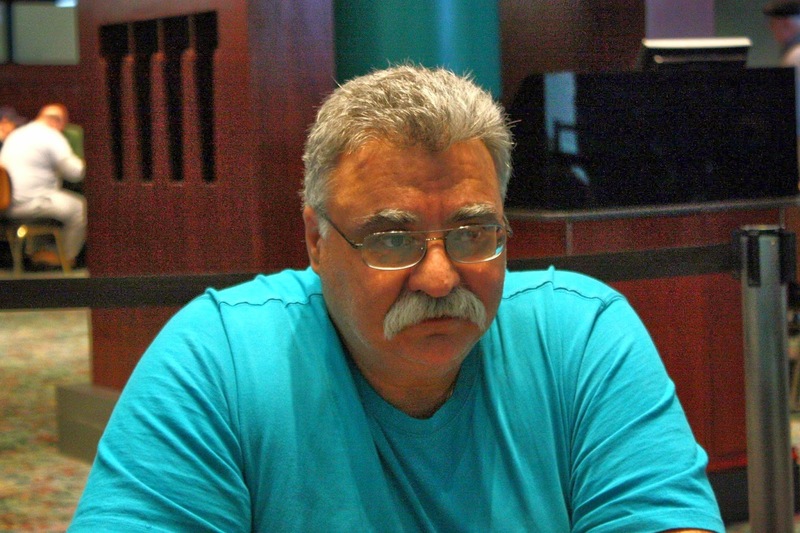 Steve said he almost folded but unfortunately he did not and was up against a bigger hand. All he could do is watch as the board ran out [4s][8s][2c][5d][Jc]. 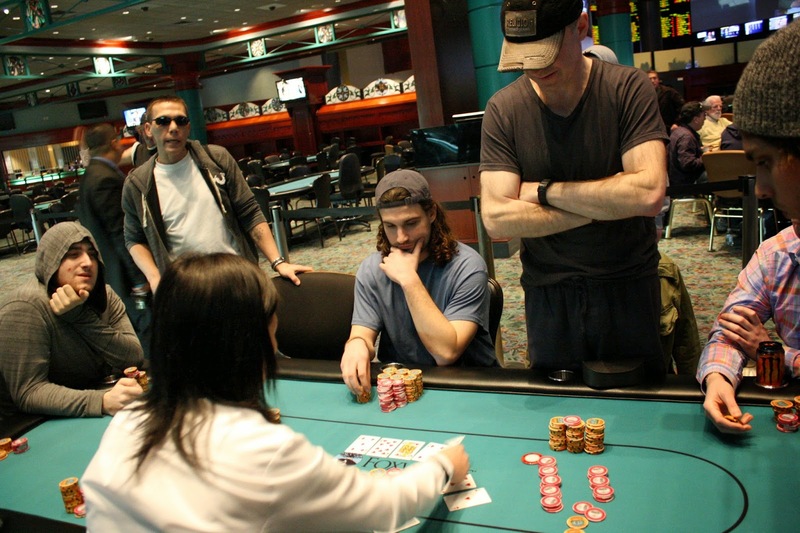 After shaking hands, Steve headed to the payout desk to collect $3,194 for his 8th place finish. 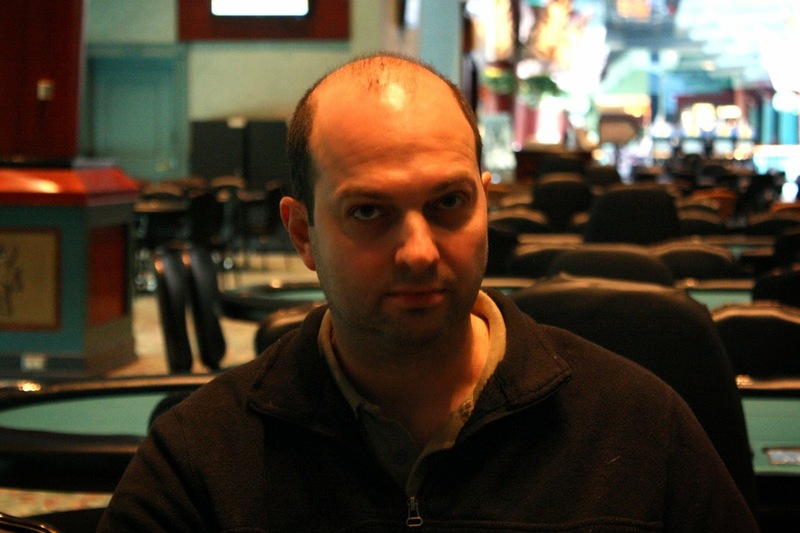 Gennadiy Kostrov was all in with [Kh][Js] against Micah Goldberg's [9s][9d]. Gennadiy would need to win this race to survive, and he did when the board fell [5d][Kc][3c][Ah][2s]. Not long after, Micah was all in with with his own [Kc][Jh] and was now at risk against his Gennadiy's [Js][Jd]. Michael went 0 for 2 in this head to head battle as the board came [4c][8d][9s][5d][2s]. 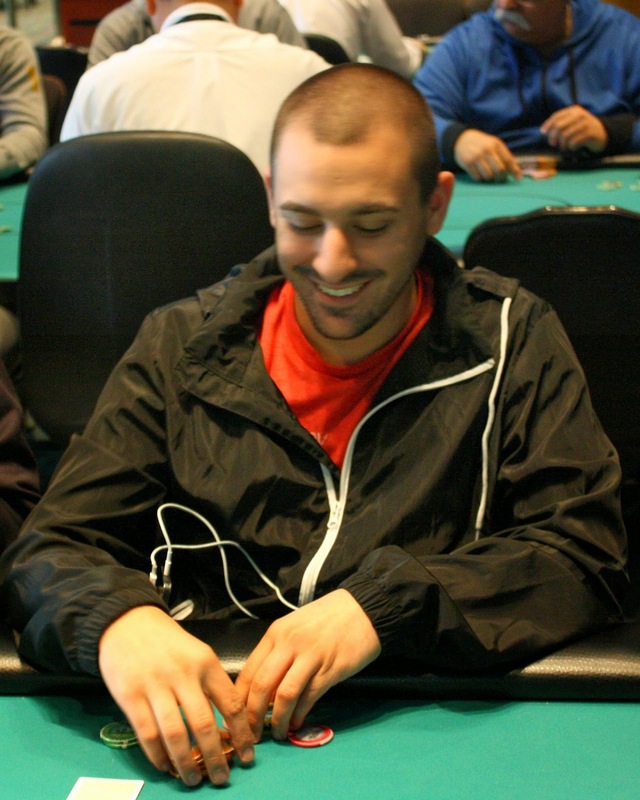 Michael will exit this tournament in 9th place, good for $2,590. 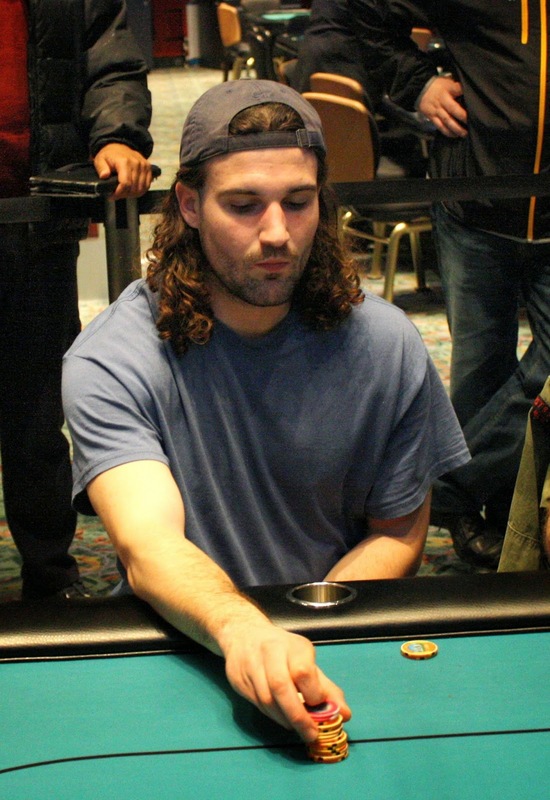 While on a penalty, Justin Schwartz was appealing the penalty to the Tournament Director and ended up being disqualified in 10th place, earning $2,158. 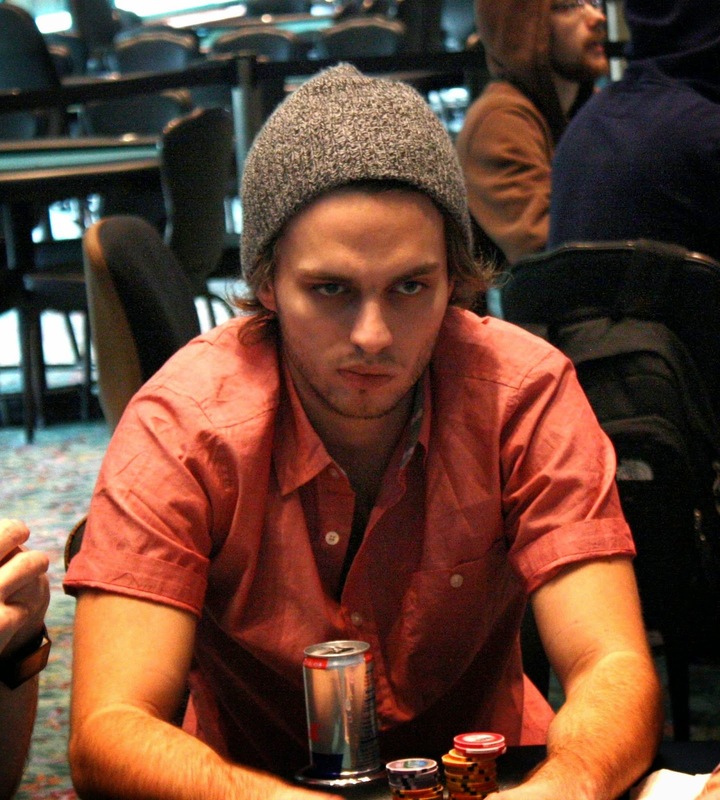 From the small blind, Chris Walsh moved all in and Gennadiy Kostrov called all in for less. Chris had [Kd][9h] to Gennadiy's [As]-X, and the best hand held up as the board ran out [4c][Td][Qc][3h][Ah]. 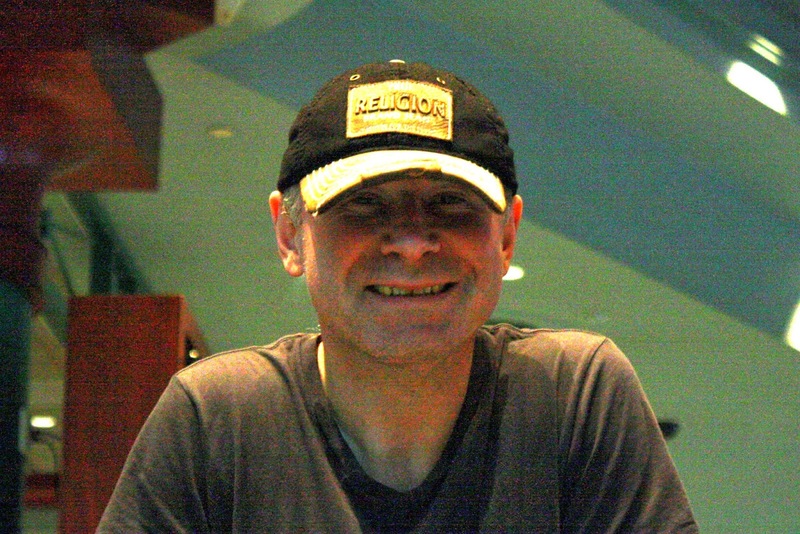 On a [5d][Th][Jh] flop, Stephen Dare checked and Gennadiy Kostrov bet 35,000. Apparently thinking the bet was 30,000, Stephen Dare attempted to check-raise to 60,000. Stephen was forced to raise to 70,000, and Gennadiy moved all in for another 78,000. After a long tank, Stephan made the call. Gennadiy was a bit of an underdog with his flush and trips draw, and he failed to hit his outs when the turn and river came [4d][4s]. 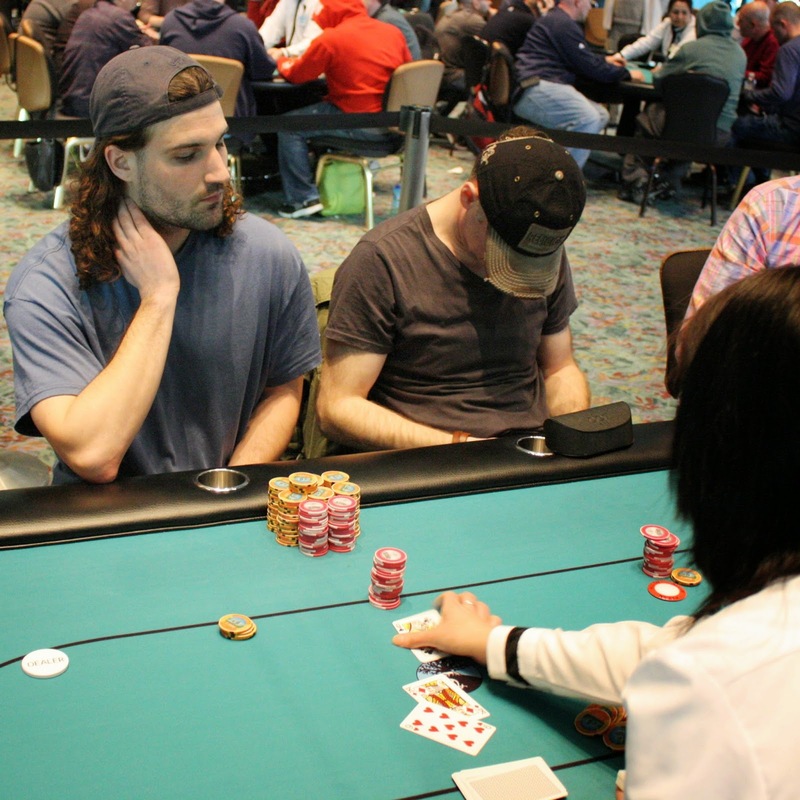 On the first hand of the final table, Dominick Pelli moved all in from under the gun and was called by Micah Goldberg in the small blind. It a race as Dominick had [Ah][Qd] and Micah had [Th][Tc]. The flop gave Micah a set as it came out [2s][6d][Td], but Justin Schwartz pointed out he could hit the [Jd] to pick up straight and flush outs. Indeed, the [Jd] hit the turn. To follow that up, the [Kc] hit the river to give Dominick the winning straight. After the hand, Micah jokingly mentioned that he wanted the blog to reflect that he lost the pot "with grace and dignity." Indeed, he did, and we are still 10 handed. With the elimination of our 13th place finisher, the remaining 12 players in Event #17 $1,100 NLH are now in the money. 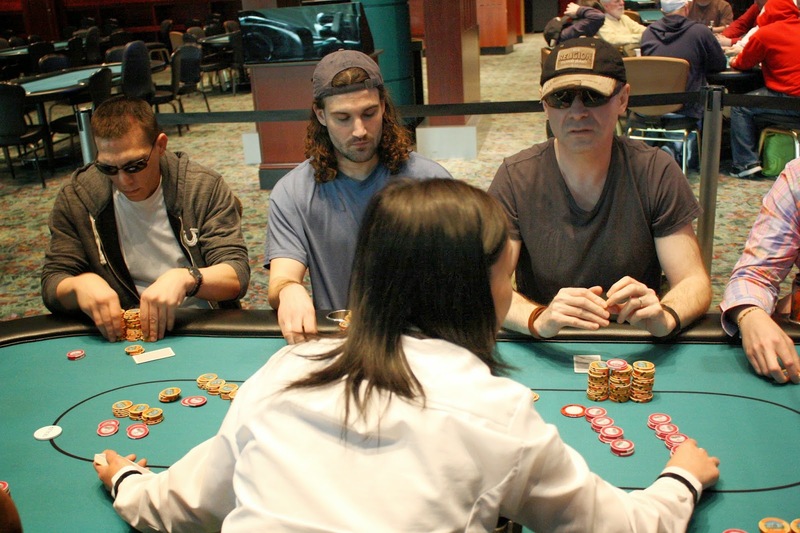 The remaining players are guaranteed at least $2,158, with first place worth $24,173. Vinny Maglio was late to Day 2, but did show up to nurse his short stack. He eventually found A-Q and moved his chips into the middle. 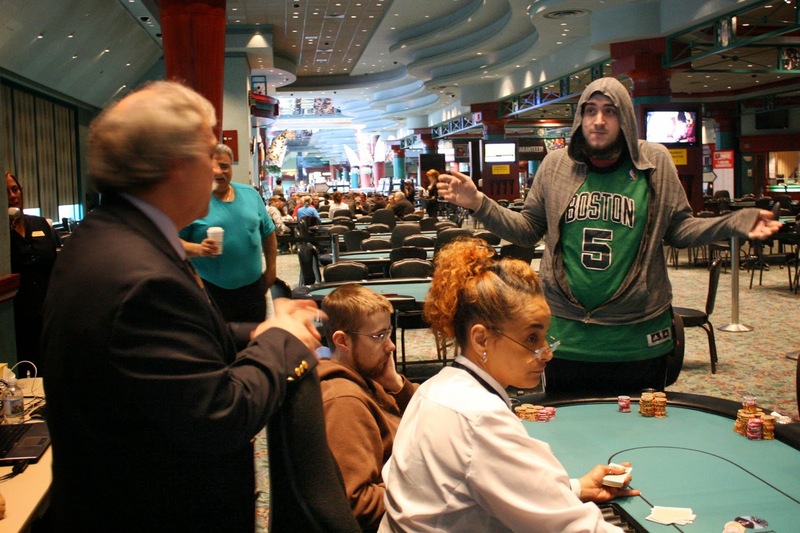 He was called by pocket jacks, so Vinny would be flipping for his tournament life. The window card was an ace, but it was followed by a jack to leave Vinny drawing virtually dead. No miracle cards came, and Vinny exited this tournament in 15th place, a few spots shy of the money. Cards are in the air for Day 2 of Event #17 $1,100 NLH. 17 players remain and the top 12 players make the money. 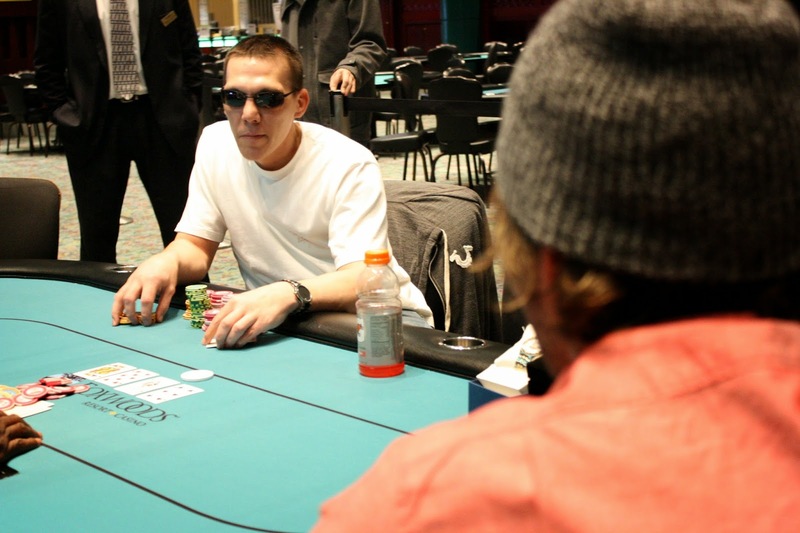 One player, Vinny Maglio, has yet to take his seat here on Day 2. We'll keep you updated as to whether his seat cashes. 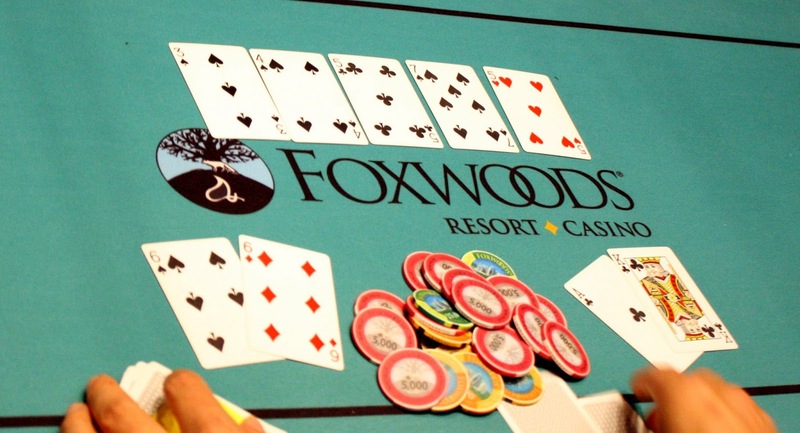 You can watch our feature table on our live stream at www.FoxwoodsLive.com. We just lost a player in 19th place, which means the tournament is redrawing to the final two tables. The tournament will play one more level (1,000/2,000 blinds with a 300 ante) before bagging up for the night and returning tomorrow at 12pm. We are still streaming our feature table at www.FoxwoodsLive.com with a few new faces.